Can you prepare tofu in a crockpot? Absolutely! This vegan crock pot barbecue tofu recipe is simply bursting with flavor, thanks to a delicious, sticky-sweet homemade sauce. 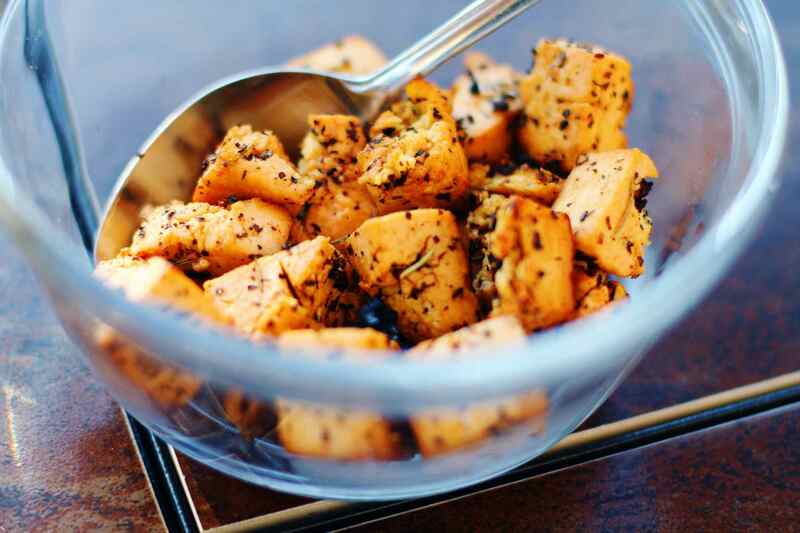 Like most slow cooker recipes, this barbecue tofu recipe is super-easy. Just load up your crock pot with the ingredients in the morning and you've got a satisfying, sweet and savory dinner when you come home at night. Serve it with rice or whole grains for a full meal, with or without added greens. Or ladle it over a crusty French baguette for a bistro-inspired preparation. Vegan-friendly and gluten-free too, this black bean and sweet potato chili makes a healthy and satisfying meal to serve family and friends. Chunks of sweet potato combine with black beans, carrots, bell peppers, onion and tomatoes in a Tex Mex-inspired sauce that carries a spicy kick. With more than 20 grams of protein per serving, it's an excellent source of protein for grown-ups and kids alike. Try serving this feisty chili recipe on game day! Ask any noodle lover what their favorite Italian pasta dish is and chances are that many will name Fettuccine Alfredo. While you may think of the typical Alfredo pasta as a cheese-laden meal, this dairy-free, vegan fettuccine Alfredo pasta recipe is healthier. It keeps all the comforting, creamy goodness but leaves all the cheese and butter behind (soy milk and flour are used to thicken the sauce instead). Olive oil (in place of butter) also gives the dish an awesome nutrition boost of Omega-3's. We challenge you not to go back for seconds. Skip take-out and try this homemade, vegan Chinese Kung Pao Tofu recipe that's full of flavor. This recipe is a tasty take on a Szechuan-style Chinese recipe that's typically made with chicken. You can use tofu to create this nutritious dish that's sure to please everyone, using all the same healthy Chinese vegetables and seasonings, including snow peas, bok choy, cabbage, mushrooms, sesame oil, red pepper flakes and lime. Serve this vegetarian Chinese food entree over rice. Ready for a big serving of comfort food? 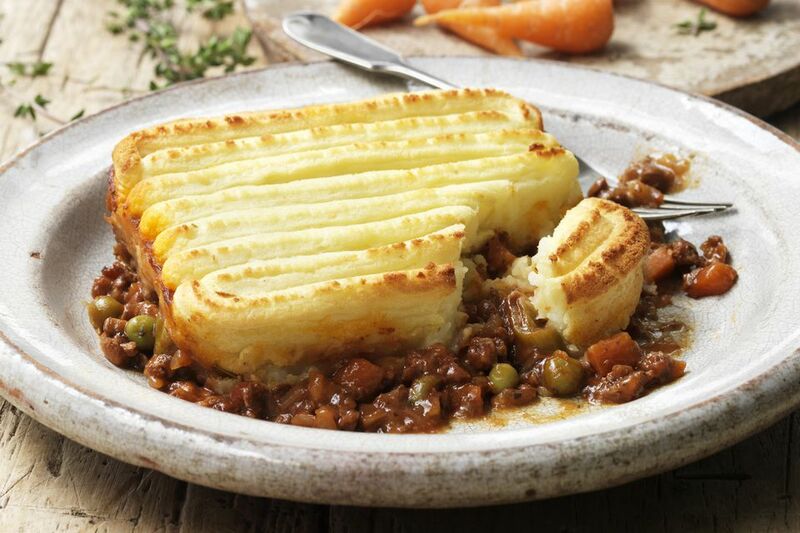 Vegans shepherd's pie is a simple vegetarian and vegan recipe that uses texturized vegetable protein (TVP) for a meaty and filling texture. Made with green peas, gravy and corn, this main course dinner dish is a satisfying, comforting and hearty meal that's great for vegetarian, vegan and omnivore diets alike. This rich-tasting, vegan yellow Thai vegetable curry is thickened with coconut milk is so delicious, you'll never believe how quick and easy it is to make. Ready in only 20 minutes, even non-vegetarians will enjoy this vegan recipe that's full of fun flavors and wonderful textures. Sweet coconut milk combines with an abundance of healthful, yummy vegetables in this yellow curry that your whole family will love. This vegan pasta e fagioli (literally "pasta and beans") is a heartwarming Italian stew that's perfect for colder evenings when you crave a dinner that will stick to your ribs. This high-protein vegan version of the traditional recipe features white beans for loads of healthy fiber and protein. They're cooked along with small pasta shells in a nutritious, Italian-seasoned tomato sauce with plenty of garlic, fresh basil, oregano and paprika for extra flavor. Make it with gluten-free pasta for a gluten-free meal. When you're craving a hearty meal, try cooking up these "real" tasting vegan lentil meatballs, made from nutrient-rich, yummy red lentils and earthy mushrooms. Also featuring flax seeds, which are high in Omega-3s, this vegan and dairy-free recipe cooks up a family-sized amount of meatballs. Perfect for serving over pasta or with your favorite sauce. This recipe makes a great buffet appetizer or potluck party dish, too. Peanut butter for dinner? Yes, please! Tofu and vegetables make for a super-healthy dinner, and this extra saucy, Asian-inspired vegan tofu stir-fry with peanut sauce is just as delicious as it is good for you, thanks to being smothered in a fabulously delicious peanut sauce. With earthy shiitake mushrooms and crunchy snow peas adding texture and plenty of fiber, you'll love this vegan dinner recipe that's also gluten-free. Serve it over quinoa, rice or whole wheat noodles for a complete vegetarian dinner. This easy vegan pasta puttanesca with capers and olives is a traditional Italian pasta dish that originated in Naples, and gained worldwide popularity thanks to its perfect blend of Italian Mediterranean flavors. Here's an easy vegetarian and vegan recipe for making the dish that's low-fat, too! Cooked pasta (choose your favorite) is tossed with a delicious tomato sauce that includes capers, kalamata olives and red pepper flakes. Perfect for family dinner, or whenever you're serving a crowd. Everybody loves fajitas and this simple vegetarian mushroom fajitas recipe is yummy enough to serve as a main dish at dinner, or makes a good buffet entree. Vegetarian fajitas are made with meaty-tasting mushrooms and crunchy bell peppers for plenty of healthy and nutritious flavor. Make it as a vegan-friendly recipe when you omit the sour cream (or use a vegan non-dairy sour cream substitute). Risotto is one of those meals that makes guests feel special when you serve it. This creamy, aromatic vegan mushroom risotto recipe is scented with a shiitake mushroom broth, woodsy thyme, and dry white wine for a delicious preparation that's also healthier than the typical butter-and-cheese laden varieties. You can tweak this refined vegan recipe by adding vegetables such as broccoli or leeks to round out its nutritional value. It's elegant comfort food at its best. Everybody loves lasagna, and this delicious vegan lasagna recipe is suitable for vegan and vegetarian diets. Plus, it's low in fat and cholesterol-free. Vitamin-rich sweet potatoes are layered with more healthy vegetables, including mushrooms, broccoli, fresh bell peppers and corn, then smothered in pasta sauce and Italian spices, and topped with a crunchy cashew topping. It's so good, your family will ask you to make it again and again. Cook up the tastes of India in under 30 minutes with this quick and easy vegetarian and vegan broccoli and potato curry recipe that's wonderful for family dinners and buffet parties alike. Fresh broccoli and potatoes are cooked in an Indian-spiced tomato sauce mixture with classical Indian spices, including garam masala, cumin powder, chili powder and cayenne pepper. It's all finished off with a touch of lemon juice to make the flavors pop. Serve this healthy vegan and gluten-free dinner recipe alongside rice or your other favorite grain, for a simple and tasty vegan meal. Taco night is a family-favorite night! Here's a 30-minute vegan tempeh tacos recipe that you can put on the table easily on weekdays. Satisfy the whole family with these vegetarian and vegan tacos that use tempeh instead of meat as a filler. Top with your favorite vegetarian taco fillings, such as salsa, fresh lettuce, guacamole and vegan cheese. This vegan lentil soup recipe is so tummy-warming and comforting, it's sure to become a staple vegan dinner recipe in your household. It's also inexpensive and easy to make, ensuring that you'll come back to this recipe again and again. Full of healthy vitamins, minerals and antioxidants, this soup is a great source of protein and dietary iron, and makes the perfect, warming lunch or dinner when it's cold outside. Serve with a crusty baguette and a green salad for a full vegan meal. Skip take-out and try making this authentic vegan-friendly pad Thai that's perfect for Thai food lovers, or anyone who wants a lighter noodle dish without the meat. This Pad Thai recipe offers plenty of protein and healthy vegetables, and features bold Thai flavors and an abundance of textures. Makes a great vegan dinner for one, or for the whole family. Want a comforting macaroni and cheese recipe that's ready in 30 minutes, and also suits vegan and gluten-free diets? We've got your mac and cheese recipe right here. Easy to make and easy to please, this simple vegan gluten-free macaroni and cheese recipe is healthy and delicious, too. Who could ask for more? You can dress this recipe up easily as well. Just toss whatever favorite herbs and veggies you have on hand to make this recipe extra nutritious and special. Moussaka is a rich, saucy, vegetable-based casserole-style dish that's popular in Greece and many Eastern European cultures. This tasty and easy vegan moussaka features eggplant, tomatoes, breadcrumbs, vegan cheese and aromatic spices, all ladled with a decadent tasting Bechamel sauce made with soy milk. Makes a great buffet entree or weekday family dinner recipe, and tastes even better warmed up the next day. Here's the easiest vegan Thai vegetable curry recipe that delivers amazing Indian flavors, without all the fuss of typical curry recipes. This 30-minute dinner recipe results in an authentic, homemade Thai vegetable curry full of amazing tasting herbs and spices. It's all cooked in one pot, too, so there are fewer dishes to deal with after dinner. Serve with your choice of rice or grains for a nutritious vegetarian and vegan dinner.